Treated diamonds are diamonds that have been manipulated in some way to enhance their beauty. Diamonds have been treated since the Victorian era. It is rarely evident to the naked eye when a diamond has been treated. Federal guidelines mandate the when the treatment is not permanent, require special care, or have significant effect on the value the treatment must be disclosed to the consumer. The first method that was utilized to treat diamonds occurred in the Victorian Era when tinfoil was adhered to the back o a diamond affecting the color of the gem. Usually it was applied to diamonds when they would be set in a closed back setting. Under magnification evidence of foil back diamonds can be detected by seeing areas of the foil lifting or moisture caught between the diamond and the foil. In modern times other ways of coating have been developed. Two methods are used, violet-blue dyes or vacuum sputtered films added to the girdle and pavilion of the diamond can alter the color of the diamond. The dyes can easily be removed with alcohol. Vacuum sputtering is hard to detect but can be removed by using dipping the diamond in sulfuric acid. Another modern technique is to coat an imitation diamond with a thin coating of synthetic diamond. All of these methods by federal statute must be disclosed to the consumer. Diamonds were originally irradiated in 1904 by burying diamonds in radium bromide salts. These diamonds changed to green, took many months to irradiate and retained some level of radiation. A diamond that was treated in this manner in 1914, and has been donated to the British Museum, still holds its color and is radioactive. Diamonds treated in this manner are not used in jewelry. Today diamonds are irradiated safely by proton and deuteron bombardment via cyclotrons; gamma ray bombardment via exposure to colbalt-60; neutron bombardment via piles of nuclear reactors; and electron bombardment via Van de Graaff generators. Both cyclotron and gamma ray treatment are not commonly used. Neutron bombardment produces a green to black diamond that penetrates the entire diamond. The diamonds are then annealed in temperature range of 500˚C - 900˚C producing yellow, orange, pink or brown diamonds. Electron bombardment produces green, blue-green or blue diamonds and the color penetrates about 1mm deep. When these diamonds are annealed (500˚C – 1200˚C) they also turn yellow, orange, pink or brown. When not annealed they keep the green to blue color range and are distinctive from natural diamonds since they have semi-conductive properties. 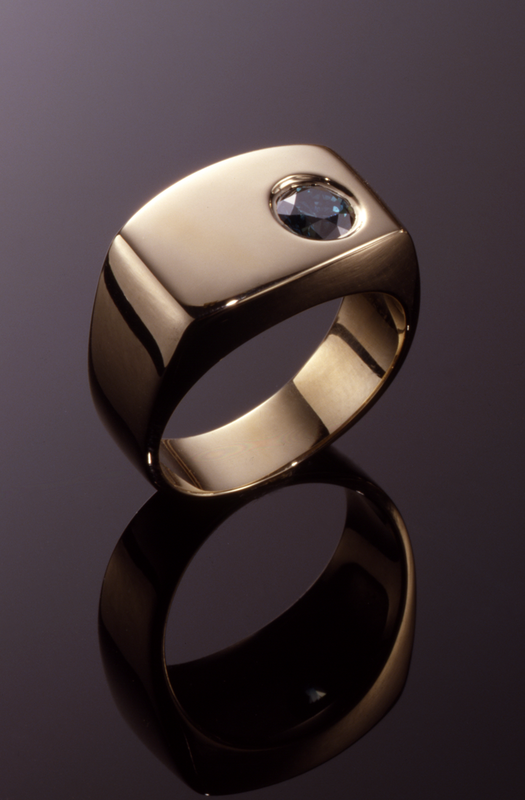 Some diamonds that are a natural brown can be turned to white diamonds by high-pressure high-temperature treatment (HPHT). This process was developed by General Electric and is affective on Type IIa diamonds only. In these diamonds color is due structural defects in the crystal and the pressure and heat changes the structure whitening the diamond. Pressures of up to 70,000 atmospheres and temperatures of 2000˚C are used in this process. Novotek a Provo, UT manufacturer discovered by accident that using HPHT process can also change brown Type I diamonds light yellow, greenish yellow, or yellowish green; improve yellowish Type IIa diamonds by several color grades, even to white; intensify the color of yellow Type I diamonds; and make some bluish gray Type I and Type IIb colorless. These diamonds can be detected as treated by well-equipped gemological laboratory. Laser drilling is used to remove inclusions in a diamond. An infrared laser is used to drill through the diamond to reach the inclusion. Once the inclusion is reached the diamond is soaked in sulfuric acid to remove the inclusion. In reflected light the surface-reaching hole can be seen as a dark circle. Often these drilled holes and the cavities are filled with a substance the same refractive index of the diamond. Fracture filling is another method of treating and enhancing the value of a diamond. This process, which involves the use of a lead oxychloride glass has a refractive index similar to a diamond and was pioneered by Zvi Yehuda of Israel. Yehuda is now one of many brand names applied to diamonds treated in this manner. This process can be detected when bright flashes of color can be seen when the diamond is rotated. The glass filling in theses diamonds can melt out of the diamond when heated with a jeweler's torch. These treatments that create colored diamonds offer options to the consumer to purchase treated colored diamonds for much less than natural color diamonds. The treatments that create whiter diamonds offers the consumer a cheaper option to buy a treated diamond that now displays a higher color grade. All of the treatments mentioned here do need to be disclosed to the consumer as per the Federal Trade Commission.